Learning how to build garage shelves is one of the best investments of time and resources you can make to increase the efficiency and maximize the space in your home. The garage has taken the place of the attic as the repository for seasonal, sentimental and extra items that are used infrequently, if at all. It's easy to let clutter get out of control with so much going on in this important space, making it almost impossible to find things when you need them. Shelving can be useful and convenient, but only if you get it right. Location is important, as is choosing a system that will work for your needs. A shelf designed to hold pool toys and lightweight plastic loungers will be groaning under the weight of woodworking equipment or construction supplies. 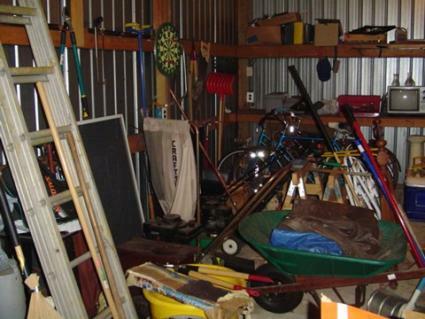 Make a drawing of your garage with notes on the location of proposed shelves and what you plan to keep on them. A good general rule is to place seasonal items in front where they'll be easy to reach and in back out of the way. Rotate them according to season. Keep emergency or heavy use items near doors. Once you have a plan, you can reinforce the shelves you know will be carrying the greatest weight. Installing a bracket based storage system is one of the easiest ways to get garage clutter up out of corners and off the floor. All you really need is a drill and any one of a number of anchoring hardware options. These systems are often sold as modular arrangements that work with solid or wire shelving.The idea is simple; brackets of one variety or another suspend a series of shelves or other storage options on your garage wall. Enhancements may include adding a pegboard or cork backing for hanging tools in the dead space between items, or adding hooks or other organizers for larger gear. If you want to customize the shelves, with some styles you can use the brackets to hold shelves you rip cut yourself from plywood in whatever lengths suit your needs. Because this approach is so versatile, you can use bracket systems to reclaim garage space that might otherwise go to waste, like the area over a window or sink, or around an electrical box. If you have drywall, try to screw brackets (also called standards) to studs for extra stability. If you can't locate or use a stud, choose anchors and screws, or bolts that are rated for the maximum weight you think the shelf will be holding. If the garage is cinderblock, look for lead anchors to hold screws. Make sure everything is level and you're happy with the arrangement before you grab the drill. You'll probably have to mark, install anchors into the wall and then install the screws through the brackets into the anchors. You won't want to mess this up and have to do it twice...or three times. Another option when contemplating how to build garage shelves where they'll do the most good is to build up instead of out. Making use of the ceiling to store large items, like ladders, garden furniture and oddly shaped sporting equipment, is an effective way to maximize wasted space. Using the ceiling to suspend shelves can create storage without sacrificing any useful area, and eliminating all that clutter from around the perimeter of the garage will make it much easier to get in and out in a hurry. You typically use the same method for installing ceiling shelving as you would for wall shelving, but it's doubly important that you find adequate support by screwing standards directly to ceiling joists. After that, hooking on suspended shelves or baskets is a breeze. For this type of installation, using a prefab mesh or wire shelf will help discourage mold growth by promoting good air flow. It will be lighter than plywood too. You can put garage shelves up in an afternoon. Once they're in place, getting the area organized and keeping it in shape will be a lot easier and probably more rewarding. You may even discover where you put all those garden gnomes you've been looking for.